The Arts Commons Project was originally envisioned to create an outdoor space for experiencing the arts. The area would include a defined park-like green space, as well as a possible structure for classrooms, exhibitions, studios, and performances. In the interest of preserving and enhancing the current green space of the lot, any potential structure would occupy only the footprint of the current brick building, without that of the metal addition, allowing for even more outdoor space. This green space will provide a place to play, create and experience the arts in the open air. The Lawrence Arts Center and the Salvation Army currently partner to use the small green space as a playground for the Lawrence Arts Center’s Preschool and Kindergarten. 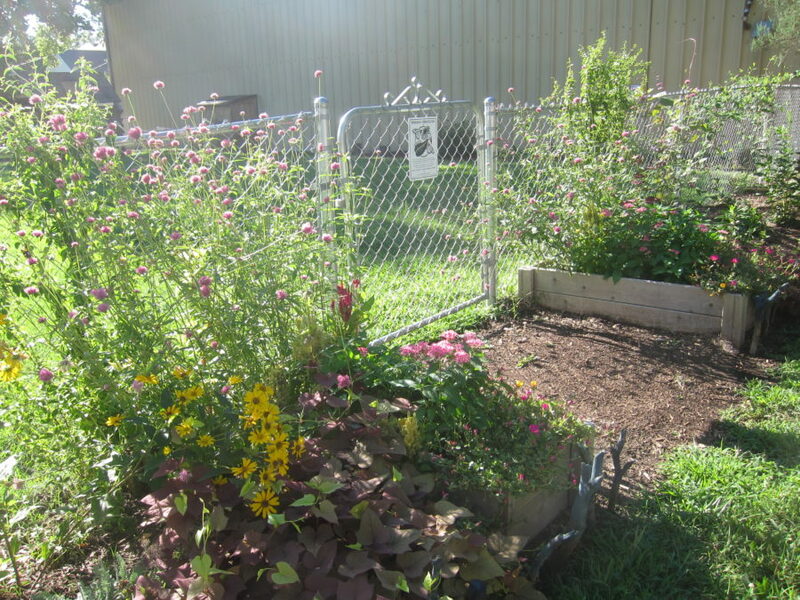 It is home to a garden, outdoor play equipment, and a registered Monarch Waystation. The need to protect and preserve neighborhood green space, used by many area groups including the Arts Center, under threat from commercial development on New Hampshire. As part of the City agreement with developers of the New Hampshire Street properties, a Tax Increment Fund (TIF) was created to use a percentage of tax revenue generated by the businesses occupying the development properties as a public reinvestment in the immediate block. A provision of the original TIF agreement was that revenues remaining after repayment of original development costs be used solely by an entity in the 900 block of New Hampshire Street to purchase the Salvation Army property at an appropriate time to create the Arts Commons. The City was originally envisioned to be the purchaser of the Salvation Army property, but the City has since indicated a preference that the TIF funds be used by the Arts Center to purchase the property directly to create the Arts Commons. If the TIF funds are not used to purchase the Salvation Army property to create an Arts Commons, the money will revert back to the developers. If the developers are not able to claim these funds because they have reached their cap, the funds revert back to the City general funds. 2012: A public hearing was held on July 24 to establish a Tax Increment Fund district for the North and South developments on 9th and New Hampshire. 2012: A TIF district was created that includes references to the Lawrence Arts Center use of the Salvation Army property for an Arts Commons project. 2012: The City of Lawrence offered to purchase the Salvation Army property, when they are ready to sell, using the TIF fund and deed the property to the Lawrence Arts Center to create an Arts Commons area: a green space for creative play and public art. 2012: The Salvation Army began planning to relocate away from the downtown area. At that time they were not ready to sell the property until new property had been purchased, and a feasibility study and a capital campaign complete. 2012-2015: Salvation Army began working through the challenges of purchasing a new property and planning for the construction of a new building. 2015-2017: Salvation Army purchased property southeast of downtown, began and a feasibility study to determine the makeup of a new building. The Salvation Army and the Lawrence Arts Center began coordinating timelines and logistics for the sale of the property. 2017: The City of Lawrence declined to use the TIF funds to purchase the Salvation Army property. Instead, the City declared they would make the TIF funds available to the Lawrence Arts Center to purchase the property and assume ownership – if TIF use is approved by the City Commission. 2017: An agreement was drawn up between the City and the developers outlining time frames for the Lawrence Arts Center to use TIF funds for the purchase of the Salvation Army property. An addendum was added to provide a framework for the use of TIF funds by the Lawrence Arts Center. Addendum was signed by the Lawrence Arts Center. 2017-2018: Salvation Army continued to complete internal steps to prepare for the sale and move of their organization, staying in communication with the Lawrence Arts Center on the status of their move. 2017-2018: The City, with input from the Lawrence Arts Center and the Salvation Army, adjusted dates on a draft TIF agreement to fit the new timeline. The new agreement contained new audit requirements related to the developers’ use of TIF funds. 2018: The Lawrence Arts Center and the City began to re-draft TIF reimbursement language to fit the real timeline for the purchase of the property. 2018: The developers rejected new audit requirements in the re-drafted TIF agreement. The agreement was not signed. 2018: With the date in the draft agreement pending as the City and developers negotiated audit language, the Salvation Army and Lawrence Arts Center began final negotiations for the sale of the property in hopes that the agreement would be signed in time to meet the first milestone date. 2018: The first milestone date in the TIF agreement, of December 31, 2018, for the Salvation Army and the Lawrence Arts Center to reach an agreement on price, passed while negotiations were concluding. 2019: On January 9th, the Salvation Army and Lawrence Arts Center reached a final agreement on price, ten days after the TIF agreement milestone date. 2019: January 22nd -24th, City was informed that a final agreement on price was in place. The City asks the Lawrence Arts Center to request approval for the use of the TIF funds from the City Commission for the purchase of the Salvation Army property. 1. The Lawrence Arts Center is not financially able to acquire the property without the TIF funds. 2. The Arts Commons was an agreement reached during the development of 9th & New Hampshire to mitigate the loss of green space, and New Hampshire becoming all large scale buildings. 5. The Salvation Army lot includes our Preschool and Kindergarten’s outdoor playground, vegetable and flower garden as well as a registered Monarch butterfly Waystation. It is also used as an outdoor play and art-making space in our afterschool programs and summer camps. The Arts Commons project will allow that to continue and be enhanced. 6. The use of the TIF funds for the Arts Commons provides an opportunity to expand the cultural arts goals of the City, without increasing the City’s workforce, assets or liability. 7. The Arts Commons will strengthen the Arts Center as a community asset. 8. If the TIF funds are not used for this purpose, they go back to the developers, and the Lawrence Arts Center would be unable to purchase the property. 9. If the Lawrence Arts Center cannot purchase the property, the Salvation Army will sell to the highest bidder, which will likely lead to the loss of this space as green space or cultural use. 10. If the Salvation Army property is developed, we will lose our students’ playground, and a registered monarch butterfly Waystation located downtown. Sundays from 1 p.m. to 9 p.m.